Tinosorb S Aqua is the new, water soluble version of the oil soluble Tinosorb S (Bemotrizinol). Bemotrizinol, which an oil-soluble organic UV filter, is currently considered to be the most effective UV absorber in terms of SPF . Bemotrizinol is a broad spectrum UV filter with efficient absorption in both UVA and UVB spectrums, peaking at 310 (UVB) and 340 (UVA) nm . Besides its efficiency, Tinosorb is characterized by high stability. Research showed that even after being exposed to 50MED (minimal erythemal dose) over 98% of it remains intact . Tinosorb S Aqua was specially created to bring the powerful properties of Tinosorb S – which is a powder – in the water phase. 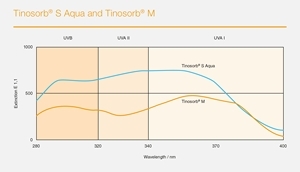 Tinosorb S aqua acts in the water phase to provide broadest-possible UV protection and photo-stability. It offers increased formulation flexibility and the broadest spectrum UV protection in the water phase which makes it ideal for formulations with other UV filters both organic and inorganic. Because it comes in the form of liquid dispersion, Tinosorb S aqua has great flexibility and versatility when it comes to formulation. Similar to the other products in the Tinosorb range – M and S, it is very efficient at low concentration and free of preservatives. Furthermore – it can be cold processed . It offers increased formulation flexibility, and can also be combined with its oil-soluble counterpart, Tinosorb® S. It is highly efficient at low concentration, free of preservatives and can be processed cold. Tinosorb® S Aqua is ideal for a wide array of effective sun care and face care products. Studies assessing Tinosorb’s safety showed that when formulated into a sunscreen showed the skin penetration is minimal thus completely compatible with cutaneous use . Furthermore, Bemotrizinol acts as a stabilizing agent for less stable compounds such as avobenzone . Some organic (chemical) UV filters raised concern on locally inducing estrogenic activity, thus potentially inducing hormonal imbalance. Laboratory research assessing Tinosorb products safety when it comes to hormonal activity showed that no estrogenic activity was registered . Concluding, it can be said that besides being them most efficient UVR filter available it is also highly stable and very safe to use. Due to its stability and UVR coverage Tinosorb S aqua is a great sunscreen by itself. Because it’s a liquid dispersion it is excellent to be included in other cosmetic formulations besides sunscreen. Basically, it can be used in any cosmetic formulation that needs SPF – such as bbcreams, day creams, anti-aging products, body lotions, and so on. However, Tinosorb S aqua was developed to pack the potency of Tinosorb S in a flexible matrix and implicitly to expand the versatility of formulation. Due to its stabilizing and synergic effects it can be used in combination with both organic and inorganic UV filters. The Tinosorb product range was especially developed to provide complete formulation of oil in water (O/W) suspension which is a superior formulation when it comes to uniform coverage, protection and efficiency . Formulating Tinosorb S aqua and Tinosorb M together has a synergetic effect on both UVA and UBV protection, thus an overall enhancement on SPF. 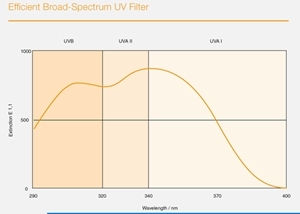 When it comes to UV filters the synergetic effect is defined as the phenomenon that happens when the combination of two or more UV filters has as a result a SPF higher than the sum of the individual SPFs. In the case of combining S aqua and M, synergy is attained in the whole UV spectrum. Tinosorb S aqua also showed synergistic efficiency with other organic UV filters such as ethylhexyl triazone or iscotrizinol  as well as inorganic ZnO and TiO2 . Oil in Water formulation of sunscreen offers several advantages sunscreen formulation has several advantages. Because of the emulsion, the UV filter exists in both the water and the oil phases a fact which supplies superior efficiency at low concentration and a higher SPF. O/W sunscreens are also more efficient because they provide better skin coverage and less frequent re-applications are necessary. Between 2-5% of Tinosorb S aqua is sufficient to meet the SPF requirements in various parts of the world, assessing to the Tinosorb product range efficiency. Due to its high resistance to UVR Tinosorb S aqua also has a photo-stabilizing effects to the formulation. The Tinosorb product range, alongside ZnO are the ideal ingredients for developing and refining an individual sunscreen that best suits the skin particularities. Vielhaber, G., Grether-Beck, S., Koch, O., Johncock, W. and Krutmann, J. (2006). Sunscreens with an absorption maximum of ≥360 nm provide optimal protection against UVA1-induced expression of matrix metalloproteinase-1, interleukin-1, and interleukin-6 in human dermal fibroblasts. Photochemical & Photobiological Sciences, 5(3), p.275.